One summer can change everything. School is out, pool is open. Welcome to summer of '85 in Hawkins. Netflix has officially dropped the first trailer for Stranger Things season 3 this morning, and it's pretty exciting. The much-anticipated (to say the least) third season of Netflix and The Duffer Brothers' Stranger Things will be hitting the streaming giant on the Fourth of July and to get you guys ready for the fireworks, Netflix has just released the season three trailer! It was teased yesterday with a video of a gaggle of rats all heading somewhere, and it looks like today we know that their destination was one hell of a bitchin' trailer. Yes, as you might imagine it is pretty epic and gave this here fan more than a few goosebumps. The whole thing kicks off with an eery version of Motley Crue's "Home Sweet Home" and the kids welcoming back gap-toothed fan favorite Dustin (Gaten Matarazzo) who has been off somewhere else. Where? Not sure yet. Too busy watching the rest of the killer trailer which just keeps building and building in intensity and scale - and it's all set to the rocking song choice of The Who's "Baba O'Reilly" or as most people know it, "Teenage Wasteland." 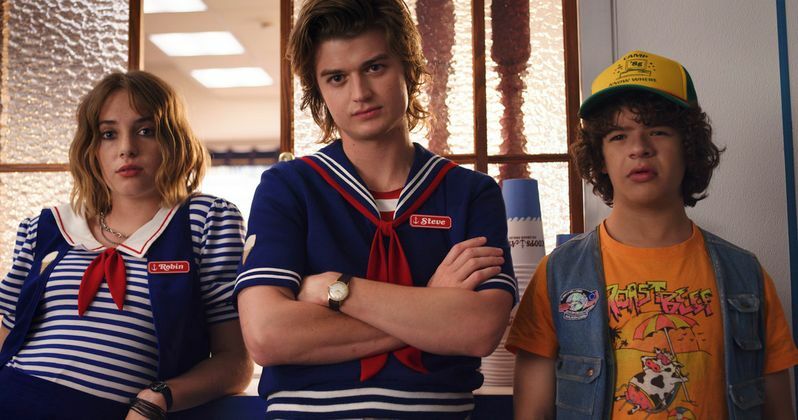 You can check out the Stranger Things 3 trailer in all it's 80's nostalgia glory for yourself below. After that, go and make sure to mark your calendars as the third season of Netflix and The Duffer Brothers' Stranger Things will be hitting the streaming giant on July 4th, 2019. Stranger Things 3 kicks off in mid-1985 when the box office was dominated by the likes of such classic films as Back to the Future. Here we find young Mike Wheeler and his semi-girlfriend Eleven have developed a full-on romantic relationship, along with Max and Lucas. However, one year after the defeat of the Mind Flayer, things are not all that they seem in Hawkins. The town has a new leader, the morally corrupt Mayor Kline (played by Cary Elwes) and a new Starcourt Mall. With the Fourth of July approaching, strange things fittingly start to happen including Lucas' sister Erica discovering a mysterious new threat, and a lifeguard at the community pool suddenly disappearing. These events and more trigger fear in those that still have the events from the previous year still fresh in their minds. Say it with me guys; things are about to get... stranger. Stranger Things 3 will see the return of Winona Ryder as Joyce Byers, David Harbour as Jim Hopper, Finn Wolfhard as Mike Wheeler, Millie Bobby Brown as Eleven, Gaten Matarazzo as Dustin Henderson, Caleb McLaughlin as Lucas Sinclair, Natalia Dyer as Nancy Wheeler, Charlie Heaton as Jonathan Byers, Noah Schnapp as Will Byers, Sadie Sink as Maxine "Max" Mayfield, Joe Keery as Steve Harrington, Dacre Montgomery as Billy Hargrove, and Cara Buono as Karen Wheeler. They will be joined in this third season by the likes of Francesca Reale (Haters Back Off! ), Jake Busey(The Predator, Starship Troopers), Cary Elwes (Saw, The Princess Bride), and Ethan Hawke and Uma Thurman's daughter Maya Hawke as Robin, an "alternative girl" bored with her job until she stumbles onto one of the secrets of Hawkins. The titles for the upcoming episodes of Stranger Things 3 were revealed last year, and they include "Suzie, Do You Copy? ", "The Mall Rats," "The Case of the Missing Lifeguard," "The Sauna Test," "The Source," "The Birthday," "The Bite," and the awesome-sounding season finale called "The Battle of Starcourt." The Duffer Brothers and Shawn Levy are set to direct most if not all of this season's episodes and they will also act as the series' executive producers alongside Karl Gajdusek, Cindy Holland, Brian Wright, Matt Thunell, Dan Cohen, Iain Paterson, and Shannon Tsang. The trailer arrives courtesy of Netflix streaming Youtube channel.